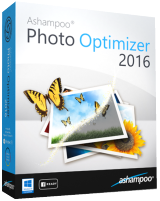 Ashampoo Photo Optimizer 2016 is a user-friendly application for optimizing and editing your photos. Various 1-click settings and the intuitive menu structure make this program ideal for beginners. Optimization is fully automatic and can fix color and lighting defects at the click of a button.